Maybe that’s why I’ve always been so concerned about making sure my pet patients were warm. Turns out more veterinarians may need to track the temperature of their patients. New research indicates that the majority of our furry friends may wake up from anesthesia feeling chilly. And that’s got me burning mad. A study published in the journal Veterinary Record found clinical evidence that 83.6% of 1,525 dogs undergoing surgery or tests requiring anesthesia experienced hypothermia or low core body temperature. The same research team discovered the percentage of cold cats to be 96.7% in an earlier study. In humans, this figure has been found to be between 30 and 60% of patients undergoing surgery and anesthesia. Why the big difference? First the good news: this study was conducted in Spain. Now for the bad news: it’s pretty warm in Spain. I’m joking but maybe, just maybe, our veterinary surgery in the US is better than veterinary teaching hospitals in Spain. Doubtful, but my thermometer is always half-hot. Hypothermia is a hot topic for small patients. 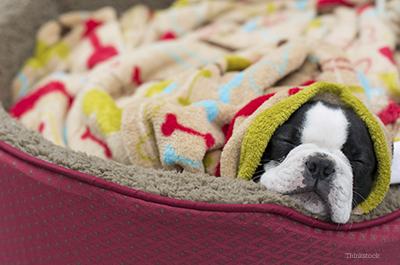 There are increased risks of surgical and anesthetic complications if a pet gets too cold. The smaller the patient, the more challenging and critical maintaining a warm body temperature becomes. For this reason the American Animal Hospital Association (AAHA) requires accredited veterinary hospitals to closely monitor a pet patient’s core body temperature throughout anesthesia and recovery. Further, AAHA standards demand that proper heating elements be provided for during and after surgery. For example, my patients are sedated on a heated pad that uses circulating warm water, transferred to a heated surgical table, and then wrapped in a device that envelops the pet’s body with warm air while they wake up from anesthesia (cutely enough it’s called a “hugger”). As I mentioned, I hate being cold, despise the notion that my patients might ever be chilled, and wholeheartedly support the AAHA-accreditations. Veterinary colleagues, get your heat on. Another reason staying warm during and after anesthesia is that is helps speed up recovery. In the study, colder animals tended to take longer to wake up after anesthesia. I don’t know about you, but as a veterinarian I’ve always felt a little relief when I see a patient’s eyes flutter to life after a procedure. Some of the best telephone calls I’ve made over the past 21 years begin with, “Suzie’s waking up from surgery now…” The sooner I can make that call, the better. The benefit of these types of studies is that they help raise awareness of the dangers of hypothermia in veterinary patients. None of the dogs or cats in the studies reported any permanent or serious complications related to their low body temperature. My advice to pet parents is to ask how a pet is monitored during and after anesthesia. How do they keep the patient warm? Better veterinary clinics will have extensive training and equipment and be eager to answer your questions. If you’re hearing sketchy answers, it might be best to look elsewhere. After all, this is your pet’s well-being at stake. While we can’t completely erase all risk from surgery or anesthesia, we can easily keep a pet warm. While surgical and anesthetic hypothermia may not be something you’ve given much thought to, next time your pet needs to have a dental cleaning, biopsy, spay/neuter, or any form of anesthesia, inquire about body heat. Tell them Dr. Ward doesn’t like being cold.